Follow the instructions below to setup and utilize the Cab Ride (Uber-like) feature. 2) Click Features from the left-hand-side of the screen (or the middle of the screen). 3) Click the Cab Ride button (or whatever your Taxi feature is titled). Click the green Settings button. The Dashboard button will take you to the main Dashboard (after everything is setup). Complete the settings options to fit your needs. Below is an explanation of each option. 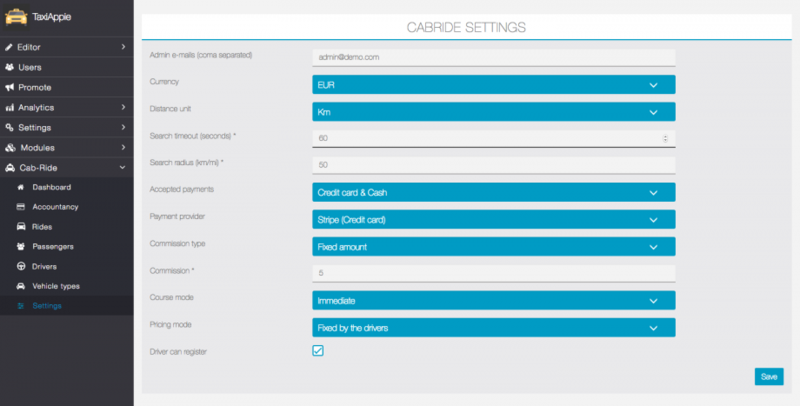 Admin e-mails – A coma separated list of the Cab Ride admins, this is used to notify payment requests, cash return, support, etc. Currency – An extensive list of all the currencies supported by Stripe. Distance unit – Kilometers or Miles. Search timeout – Defines the search request timeout, after what a request will expire if no driver answered. Search radius – Defines the search radius around the passenger location. Accepted payments – Accepts either Cash, Credit card or Both. Payment provider – For credit card payments, the module comes with Stripe, more Payment gateways can be available on request & study. 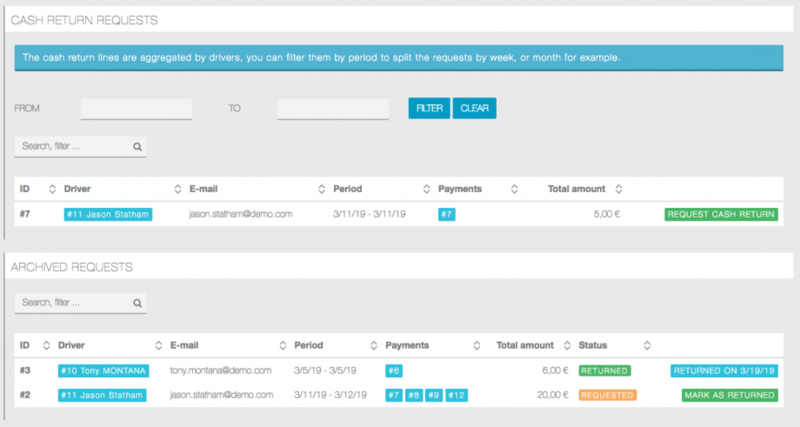 Commission type – Use this option if you want to obtain payments based on commission you can enable it, set a Fixed amount, set Percentage, or Disabled. 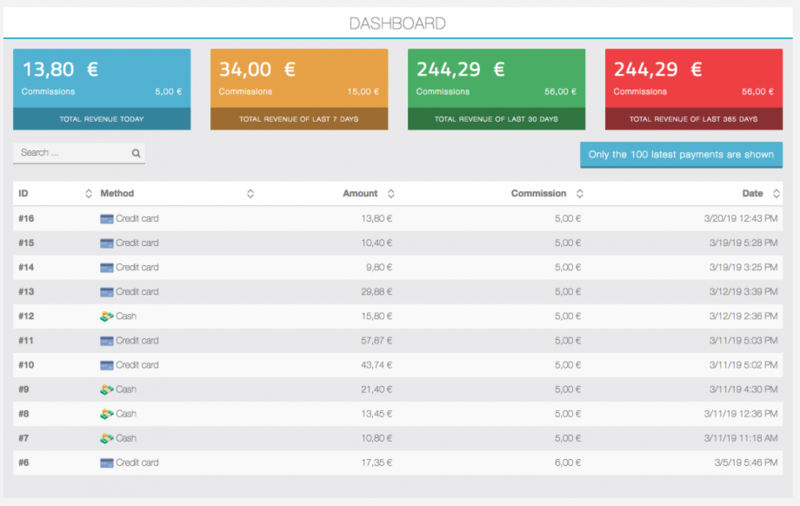 Commission – If the commission is enabled, you will defined the amount here. 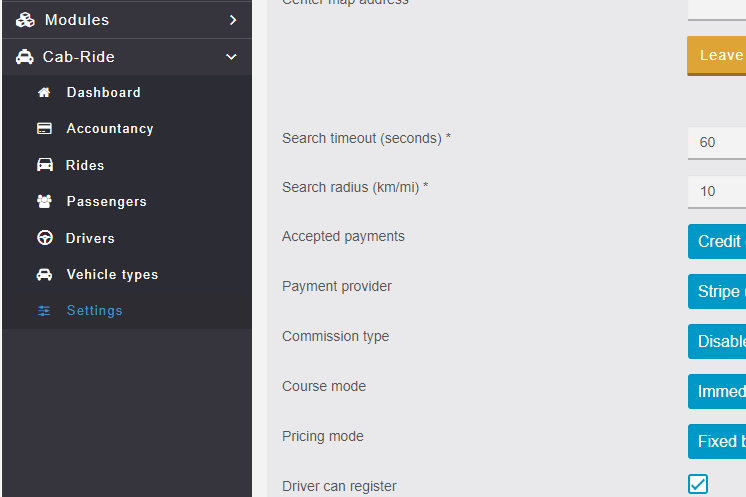 Course mode – You can choose whether to let the driver or the admin select the pricing for a cab ride. Pricing mode – The course mode defaults to Immediate in the version 1.0.0. Driver can register – When disabled, all new users will be marked as passenger. You can upgrade a Passenger to a Driver in the page CabRide > Passengers page. When you are done with the settings, you will have to create at least one vehicle type. Click Vehicle Types on the left-hand-side of the screen. Click Add A Vehicle Type to add your vehicles. Complete the Vehicle setting fields. 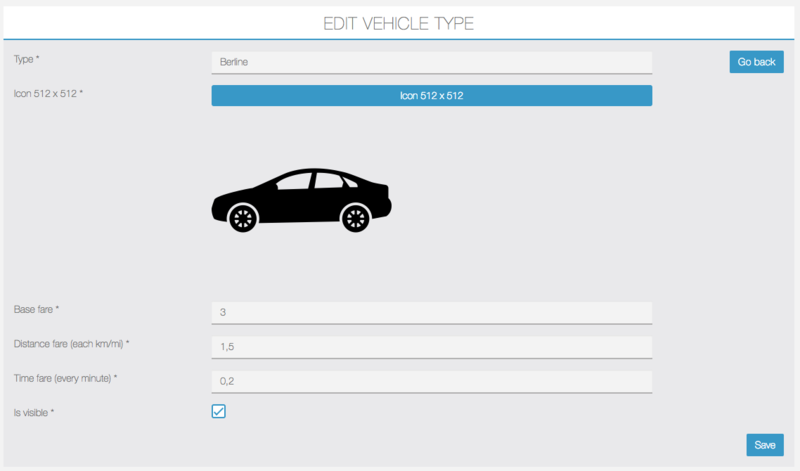 Vehicle Types – The vehicle type name and image are required fields. Fair Information – This field is required only when Pricing mode is set to Fixed by vehicle type. Click Drivers on the left-hand-side of the screen to edit your Driver settings. 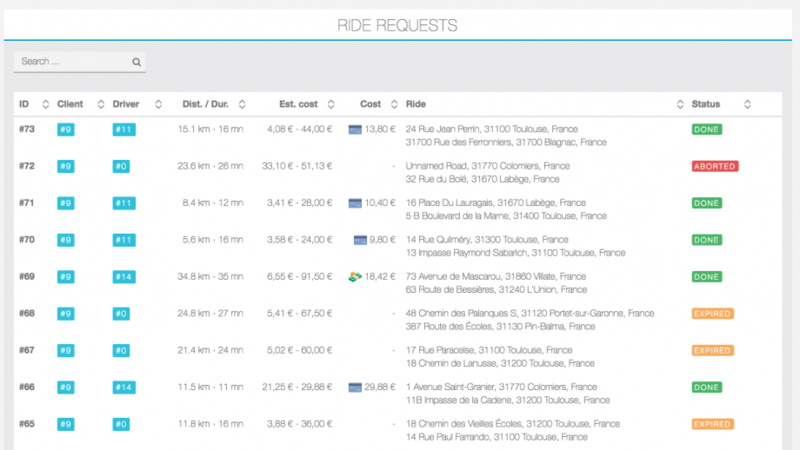 The Rides section offers an overview of all the rides & requests, with their information and statuses. › Without date filters: all pending cash return will be aggregated regardless of the time period. 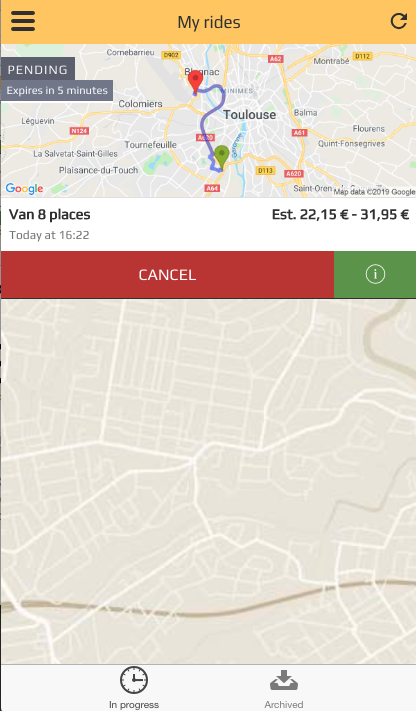 › With period filter: only rides paid by cash within the time period will be aggregated and asked for a return.When requesting a cash return, the line will be added to the Archived requests with the status REQUESTED, when the cash is returned, you can call the action MARK AS RETURNED to validate it. Payouts: On the other hand, for payments done via credit card you’ll be able to create individual or bulk payout requests. › Without date filters: all pending payouts will be aggregated regardless of the time period and drivers will be notified. 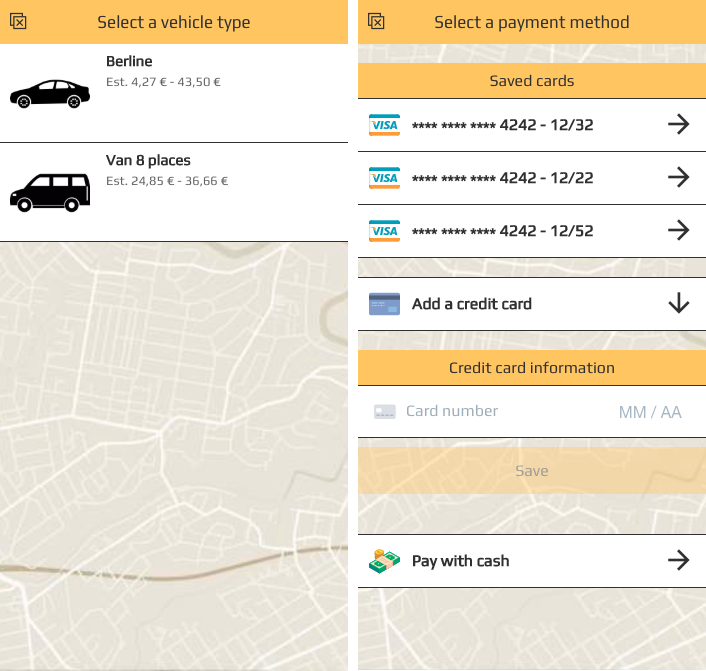 › With period filter: only rides paid by credit card within the time period will be aggregated and notified as payout in progress to the drivers. › The Pay Out action will create a pending payout for the given driver payouts. 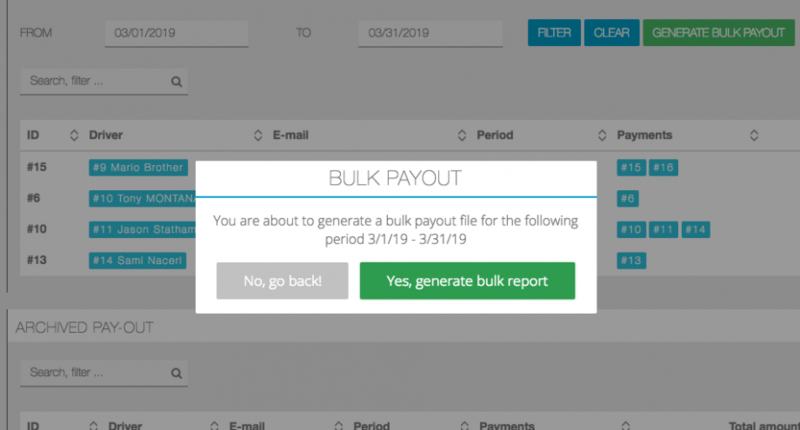 The Generate Bulk Payout action will create a bulk csv export for all the pending payouts (filtered by time period, or not). 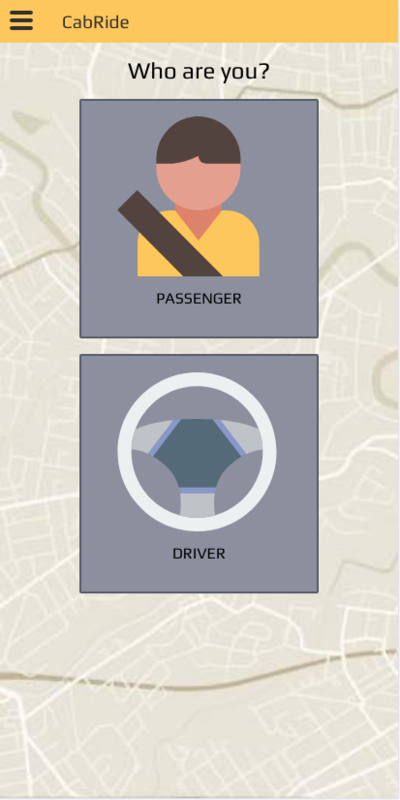 When opening the App for the first time, passengers and/or drivers will be asked to select a role (The cartoon-like images here were used simply for testing… Naturally more professional images will be used in a real app). › If the setting Driver can register is not enabled, all new customers will be marked as passenger. It’s then up to the app admin to grant customers as drivers from the page CabRide > Passengers with the action Set As Driver. 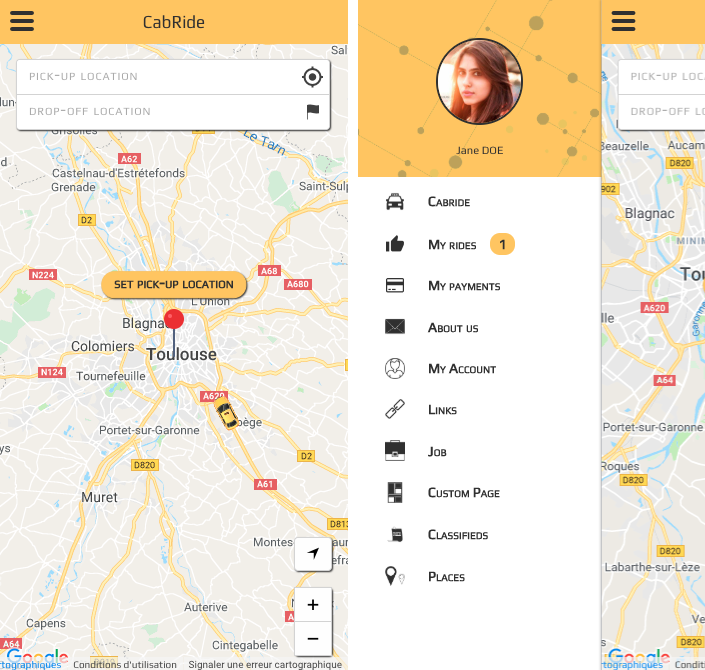 PASSENGER UI – The passenger homepage with a nearby online driver (yellow cab on the map). 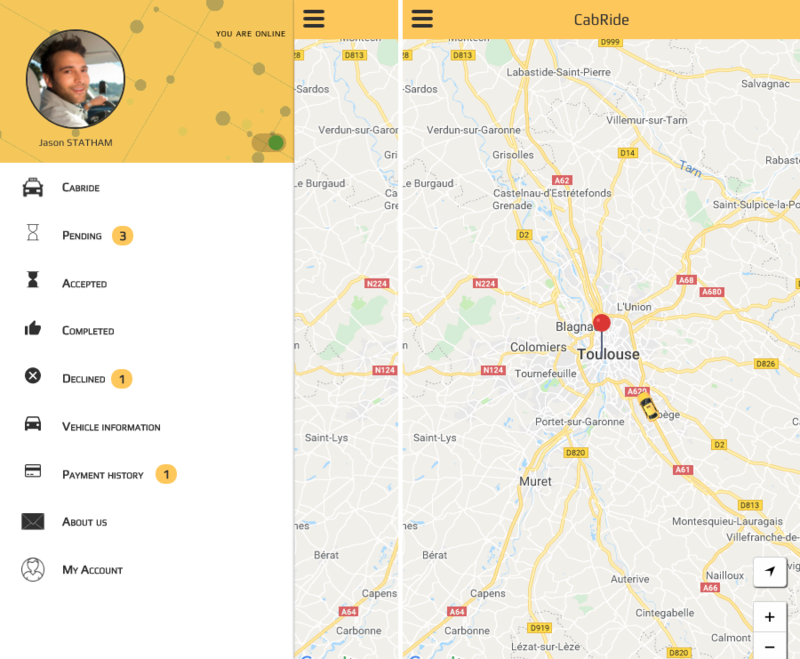 The homepage when the passenger defined a route, with estimated distance & duration.› At this step, the passenger can now start a search request for available drivers. When the search is successful, the passenger will have to choose between the available vehicle types, If multiple drivers are available, a price range is shown to inform the passenger. When only one driver is available for a vehicle type, a single cost is shown. › Passengers can securely vault one or more credit card to be used later easily. 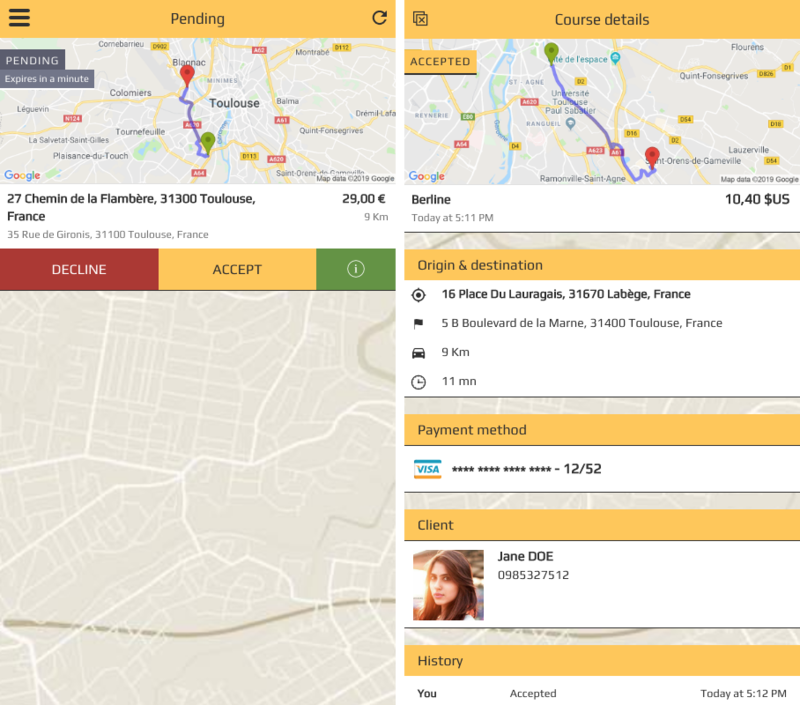 After selecting a payment method, the passenger will be directed to the page My Rides› The ride is Pending while waiting for drivers to accept, the expiration delay is shown. › While the request is in Pending state, passenger can still cancel it. › At this step, the passenger can make a phone call to the driver if needed, or see more details about the ride. DRIVER UI – Driver nav & waiting homepage, next to each section, a counter shows how many requests or actions are yet active. 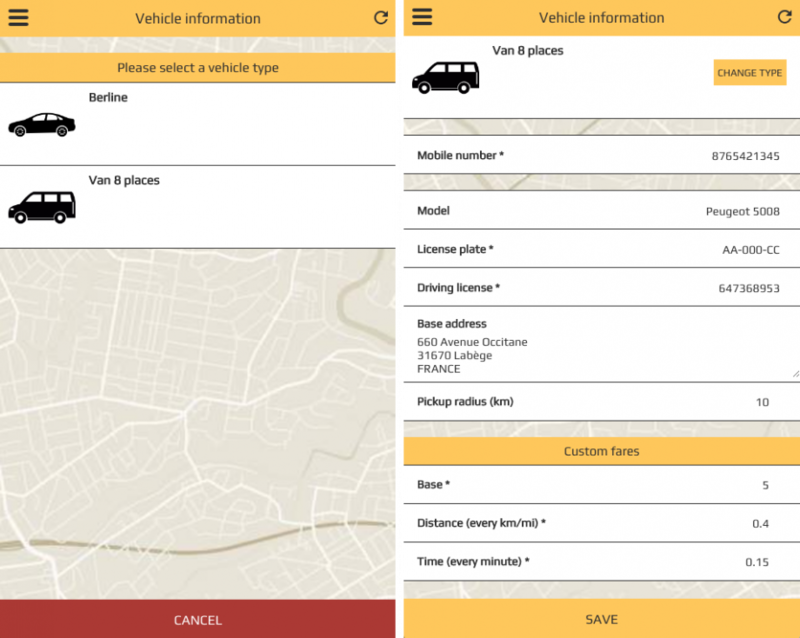 › The driver will have to select a vehicle type, and fill information before going online. › The section Custom fares is only visible & editable when the setting Pricing mode is set to drivers. 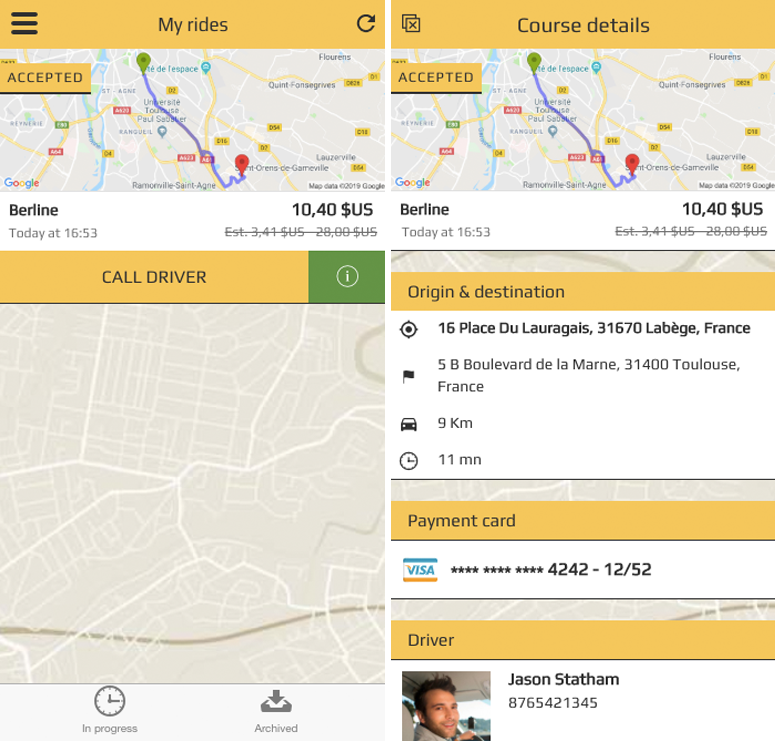 › With this pricing mode, drivers will fix their fares individually. 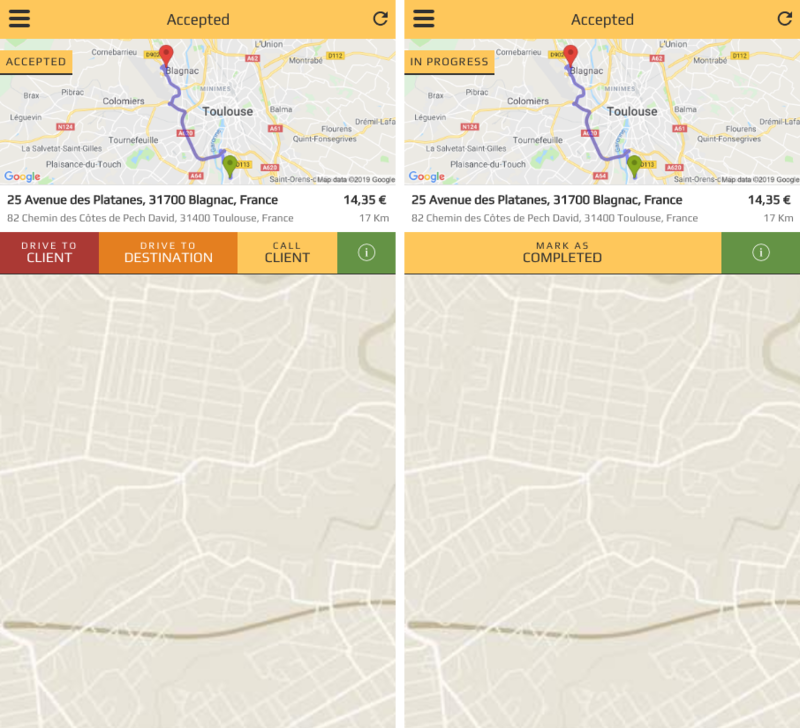 › Here the driver can review the ride request while pending, and Decline or Accept. › When the driver Decline a ride, the ride will be moved to the Declined page, the driver can still accept it, if it’s not expired or accepted by another driver. › When the driver accepts the ride, the passenger will receive a push, and the driver will get more information. 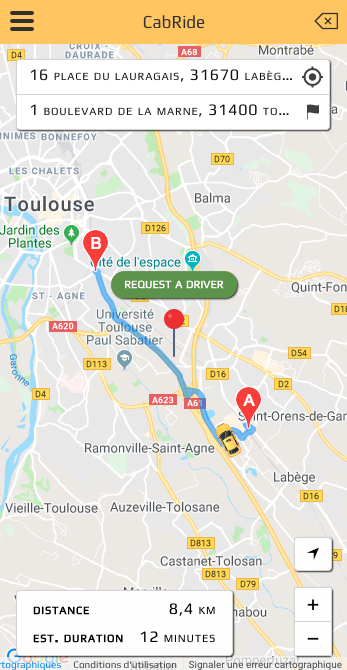 › Drive to client: The driver will inform the client he is on his way, the passenger will be informed of the estimated time of arrival of the driver. › Drive to destination: The passenger is now on-board, and the driver starts the ride. › Call client: The driver can call the client for more information. Both Drive actions will open a navigation intent to choose between Waze, Google directions, or Apple maps for iOS devices. When the ride is done and the passenger arrived at destination, the driver will be able to mark the ride as completed. › If the passenger is paying by card, the card will be charged the course total. › If the passenger is paying with cash, he pays the driver directly. 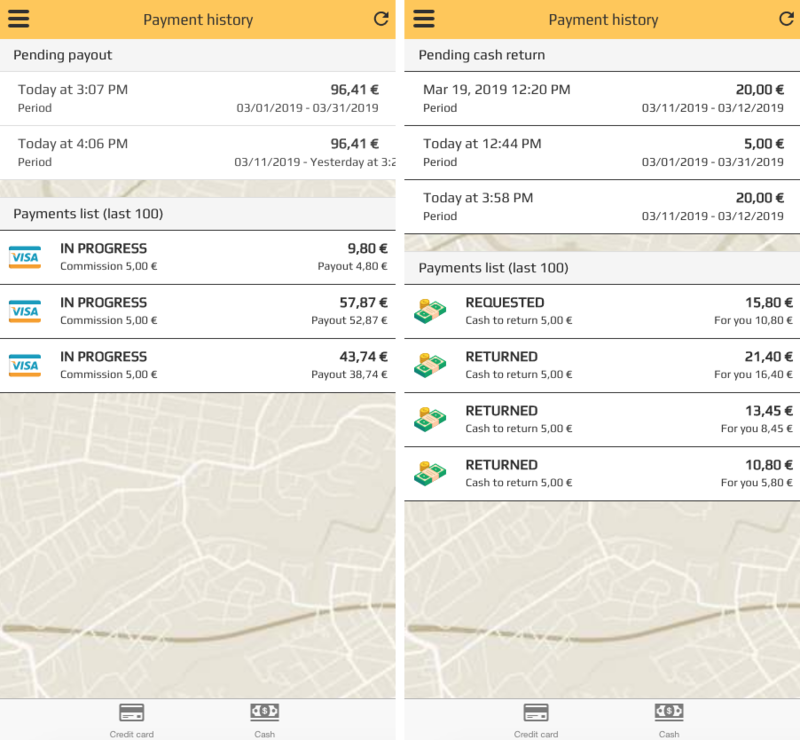 When the app admin mark payouts as pending, the driver will see his incoming payouts, with the total amount due, and the period covered. UNPAID = The payout is due to the driver. IN PROGRESS = The app admin marked this payment for an incoming payout. PAID = The payout is paid. UNRETURNED = The cash is pending. REQUESTED = The app admin requested a cash return for this payment. RETURNED = The commission for this payment is marked as returned.